How you can help those affected by Hurricane Harvey. Updated with more details about Atlanta relief opportunities. 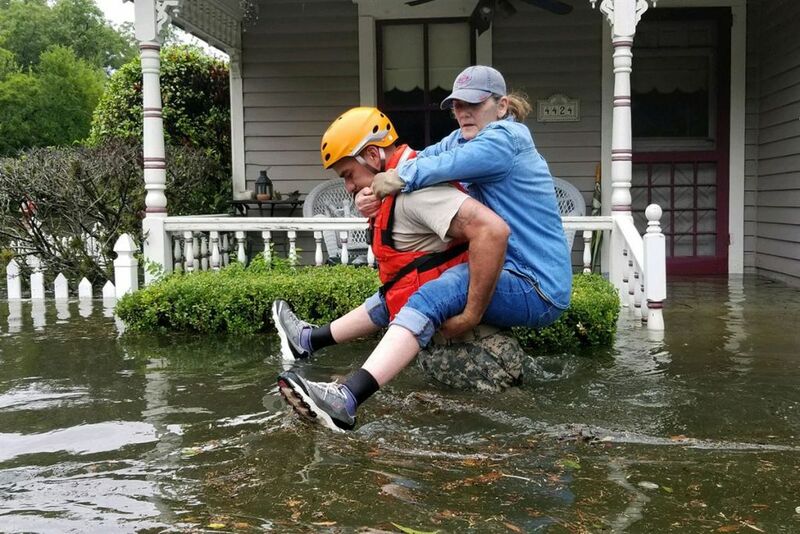 More than 3,000 people have been rescued, thousands more are homeless, and at least 14 are dead after Hurricane Harvey parked along the Gulf Coast of Texas for five days and poured more than 4 feet of rain on some spots in the Houston region. Houston’s Jewish community, clustered in the city’s southwest, was hit particularly hard by the storm. More than two-thirds of the area’s Jewish population lives in the neighborhoods hardest hit by the storm, including Meyerland, Memorial and Central City. 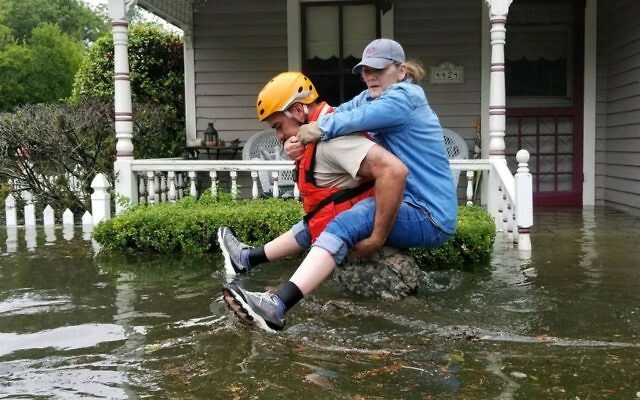 Among the options to finance relief through Jewish agencies are the Jewish Federations of North America; Nechama: Jewish Response to Disaster; B’nai B’rith; and United Orthodox Synagogues of Houston. Chabad of Atlanta has stepped up to collect donations for Houston and on Sept. 1 will be at Congregation Beth Tefillah on High Point Road from 8 to 10:30 a.m. and at Atlanta Jewish Academy on Northland Drive from 11 a.m. to 2 p.m. Working with the Orthodox Union, Young Israel of Toco Hills and Congregation Beth Jacob are seeking volunteers for a chesed mission to Houston to do demolition work on damaged homes from Sunday to Tuesday, Sept. 3 to 5. Participants, who may help for any or all of those three days. must arrange their own flights and hotel rooms, but food will be provided. Contact Rabbi Adam Starr at rabbi.starr@yith.org if you want to go. The Houston JCC announced on Facebook that it would close Friday and remain closed Sunday, with an update Sunday evening. Prior to the hurricane it collected emergency supplies for the community, according to the Texas Jewish Herald-Voice. The center suffered flood damage to its lower level and were forced to move their relief supplies to other locations. Rabbi Gidon Moskovitz of the Meyerland Minyan in Houston said that as of Sunday afternoon, more than half of his congregants had “taken in water” to their homes, some as much as four or five feet. Houston has suffered from flooding a few times in recent years, which had damaged Meyerland’s shul. The congregation had since moved to higher ground in the hopes of avoiding future flooding. Houston’s Jewish Herald-Voice reported that dozens of Jewish community members from Meyerland were evacuated to a makeshift shelter at the George R. Brown Convention Center in Downtown Houston including husband and wife Steve Wisch and Fern Bryan, who slept in cots on the floor of the GRB Sunday night, Aug. 27. On Monday, Aug. 28 the Jewish Herald-Voice reported that a number of displaced families in one Houston suburb had taken up shelter on the campus of the Robert M. Beren Academy, a Modern Orthodox day school in Southwest Houston. School officials were working with police and neighborhood volunteers to open the school to evacuees on Monday morning, Aug. 28. “There are 10 families, possibly more, who want to go,” Jenelle Garner, who is helping coordinate the move told the Jewish Herald Voice, after most of her Willow Meadows subdivision near Brays Bayou in Southwest Houston suffered heavy flooding from Hurricane Harvey. Elsewhere in Houston, two IDF veterans commandeered a rescue truck and worked for hours to help people escape their flooded homes. The two Israelis were out until 2 a.m. Monday according to a report from the Times of Israel. The Jewish Community Center of Corpus Christi was closed Friday and Sunday, and said in a Facebook post it hoped to resume normal operations on Monday. Congregation Beth Israel in Corpus Christi closed from Friday, cancelling all Shabbat services and Torah studies, it said in a Facebook post.